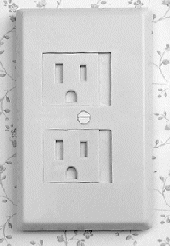 Electric outlets can be a significant source of air leaks and a hazard to children. These insulated electric outlet plate covers (for 3-prong outlets) feature an automatically sealing receptacle cover to eliminate unwanted air leaks and prevent children from insert fingers or other objects into unused electrical outlets. The spring-loaded mechanism covers the receptacle plug holes when unused. Cover is made of rigid plastic; no loose parts to lose or misplace. You only need to use a screwdriver to remove the existing outlet cover and install this in its place. Ivory. Note: outlet plates are not UL listed.